NEW YORK – September 28, 2015 – The out of home (OOH) advertising industry, led by the Outdoor Advertising Association of America (OAAA), today launched a new campaign designed to prove the unique strengths and marketing effectiveness of OOH. 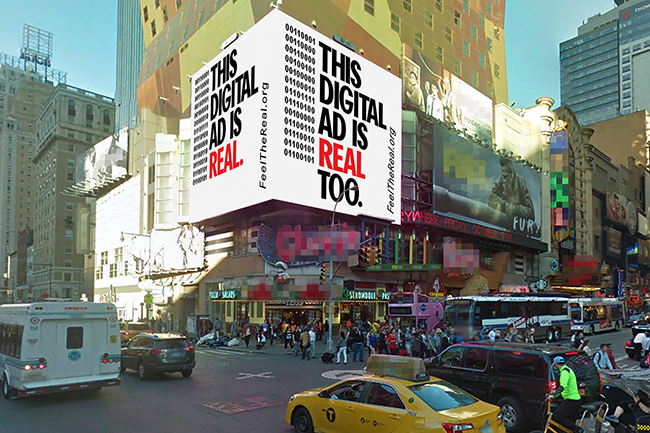 The “Feel the Real” campaign, created by agency of record PNYC, champions OOH as a real medium that reaches real people to drive significant digital engagement, while challenging the media industry to ask a critical question: How real is digital? “It's alleged that nearly half of the $14 billion spent on digital has been lost due to fraud and misrepresentation. Digital is suffering a reality problem, and we want to show how OOH – a real, tangible and quantifiable medium – can drive consumers to digitally engage with brands,” said Stephen Freitas, Chief Marketing Officer of the OAAA. “Our goal with ‘Feel the Real’ is two-fold: to build awareness of OOH’s ability to track and increase digital effectiveness, and encourage media planners to incorporate more OOH advertising into their plans,” Freitas added. 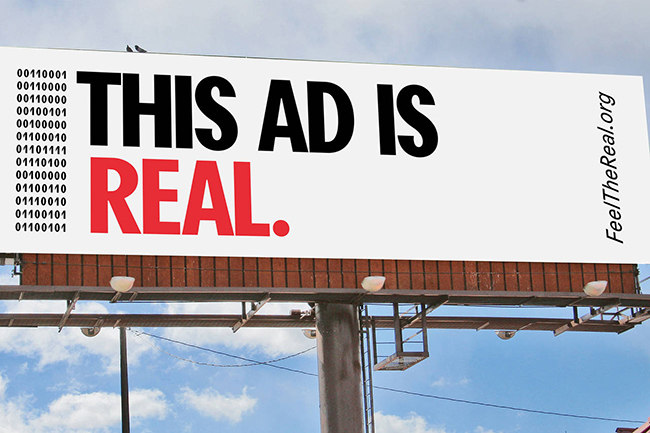 Launching in conjunction with New York City’s Advertising Week (September 28 – October 2), “Feel the Real” targets media agencies and planners while making a larger call to the public to engage with the real world. Static and digital OOH placements will be placed near media agencies and on heavily traveled commuter routes, directing viewers to www.feelthereal.org, where they can learn how OOH can both complement and accelerate digital, social and mobile advertising. Lamar Advertising Company is supporting "Feel the Real" by donating media space in New York, Los Angeles, Chicago, Dallas, Austin and Detroit. In addition to New York City, the campaign will roll out in major U.S. metro markets including Austin, Chicago, Dallas, Detroit, Los Angeles, Miami, Minneapolis and San Francisco in the coming weeks. OAAA is the national trade association for the out of home (OOH) advertising industry. Founded in 1891, the association represents more than 90 percent of the U.S. industry based on revenues. OAAA is dedicated to leading and uniting a responsible OOH industry committed to serving advertisers, consumers, and communities. 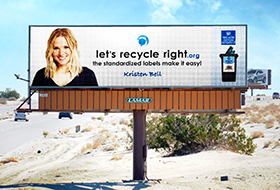 The OOH industry generates $7 billion annually in ad revenues and donates more than $450 million in space each year. For more information, please visit www.oaaa.org. PNYC (Partners + Napier NYC) is a creative boutique that unites big ideas with real world application at a global scale. Led by an award-winning senior team handpicked from top agencies, PNYC specializes in building brands from the ground up. Their growing client roster includes Lufthansa Airlines, ShopKeep, EDB Singapore, The Players' Tribune and others. With the backbone of 120 people at Partners + Napier Rochester, and sitting at the epicenter of the world's largest independent agency network, Project: WorldWide, PNYC has been designed to deliver best-in-class creative ideas and solutions for ambitious brands. Find out more at www.pnyc.com. Lamar Advertising Company (Nasdaq: LAMR) today announced that Sean Reilly, CEO of Lamar Advertising Company, is scheduled to participate in a question-and-answer session at the Goldman Sachs 24th Annual Communacopia Conference in New York City, NY on Friday, September 18, 2015 at approximately 10:30 a.m. (ET).